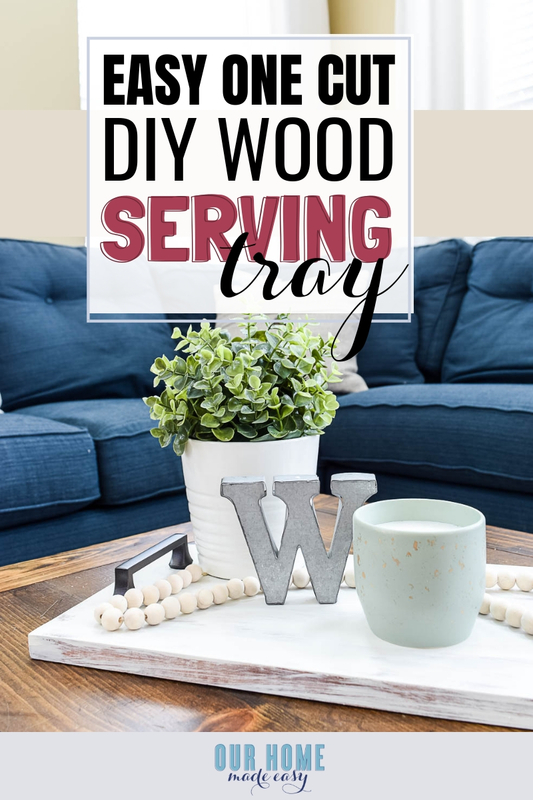 Make this DIY wooden serving tray quickly! It makes for adding an extra level of coziness to your room or even a great inexpensive homemade gift! A quick way to do this is to use serving trays throughout your space. 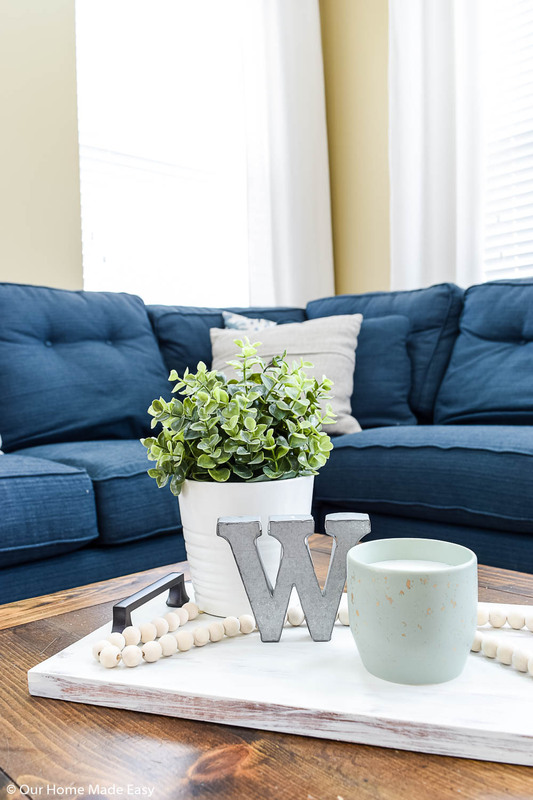 Not the kind that you actually serve food on though– the kind that adds an extra texture to a coffee table, dining room table, or nightstand. 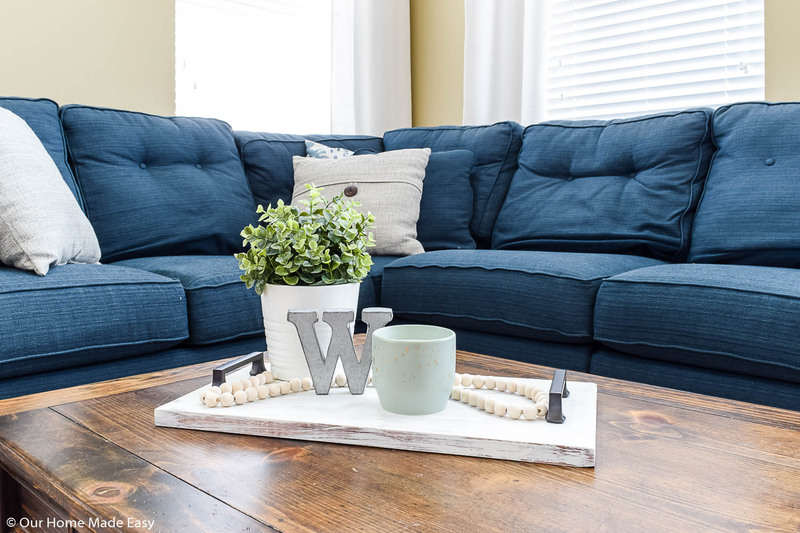 Whether it’s one you find at Home Goods, Target, or DIY yourself, they add instant style without much effort. You can choose warm wood tones or pick a neutral white to let your decor items pop! Even if the kids’ toys accidentally end up in the middle of it. It all works, I promise. And I realized that I’ve never shown you how quick it is to make one for yourself! 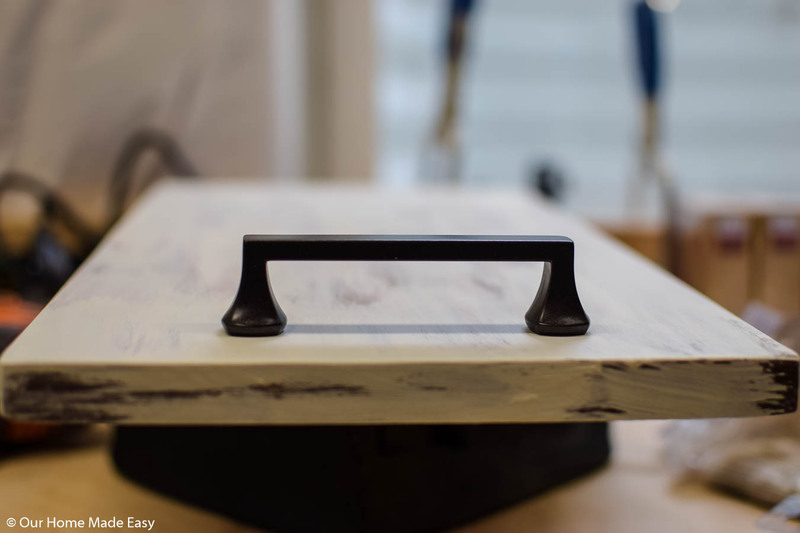 The biggest cost is $2-$3 you’ll spend on cabinet handles. That’s it. 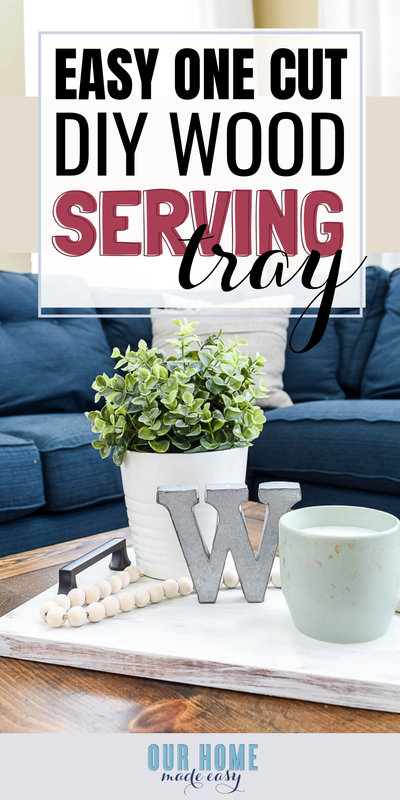 Admittedly ashamed we haven’t talked about DIY serving trays yet on the blog. 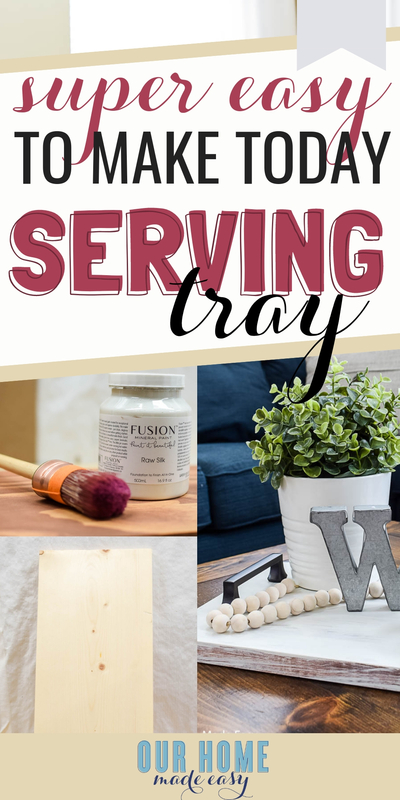 This serving tray tutorial allows you to customize your tray size, color, finish, and handles! Follow along to craft your perfect tray, over & over again. Super quick & simple! 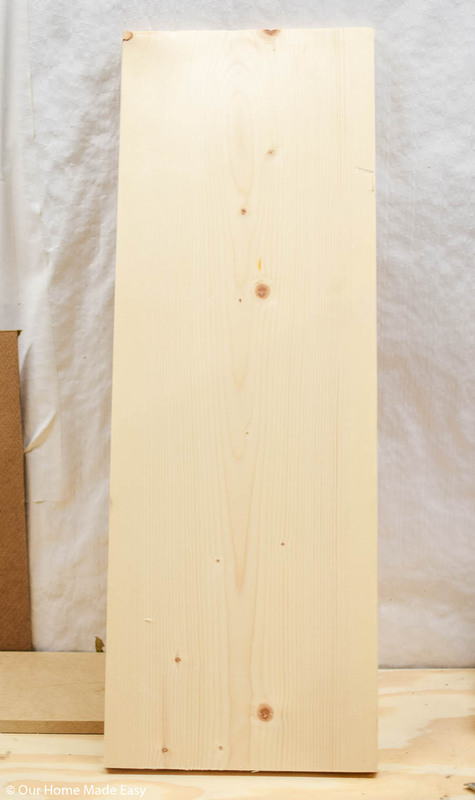 Using a miter saw, cut your wood board to preferred size. For mine, I made it 17″ long. If you have a smaller table, you may want to choose 14″ or if you are covering a larger area, you could easily make your tray 20″. It’s always easier to go longer, test the board on your surface, and then trim it down if needed. 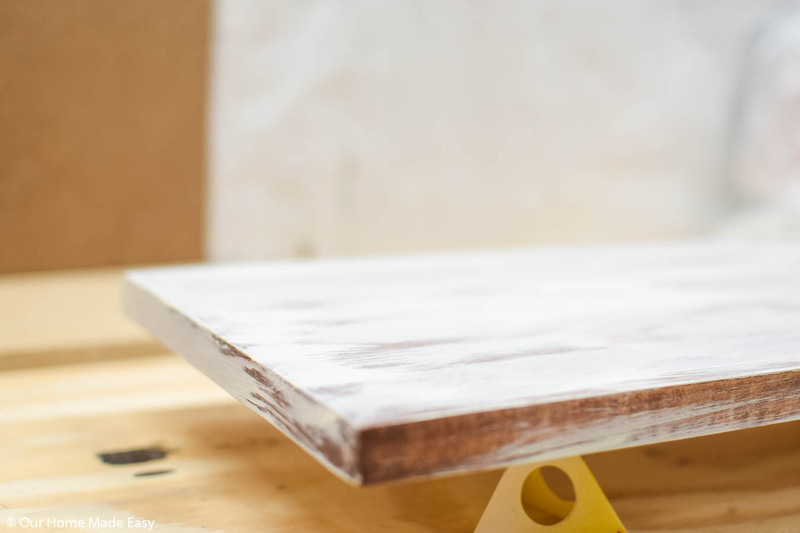 Once you are satisfied with the board length, quickly sand down any rough edges. If you have an orbit sander handy, this can be done in less than 3 minutes. 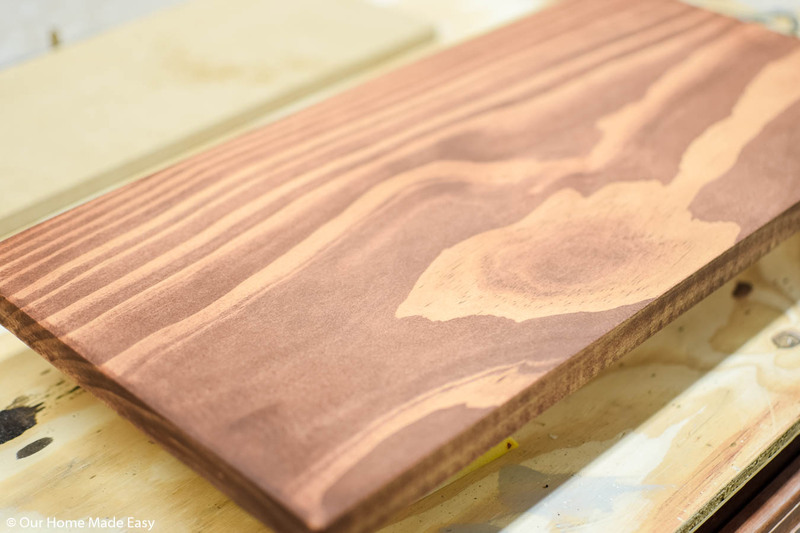 If you are using a sanding block, simply softens the edges to avoid any splinters. I like to sand down the short sides and along the top of the long sides to give it a softer look. It’s totally up to your preference. 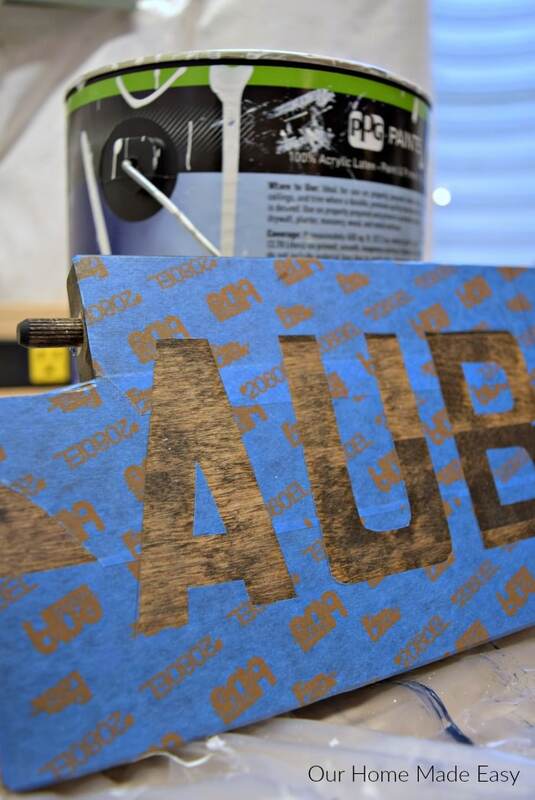 Once your board is smooth, it’s time to start decorating it! You can add stain and leave it as is, or you can paint it. For this particular wood serving tray, I stained it first. It turned out a bit more red than I preferred, so I covered it a thin coat of paint in Fusion Mineral Paint’s Raw Silk. Once the paint dried, I roughed up the surfaces with a sanding block. Allow your stain or paint to dry and you’re just about finished! 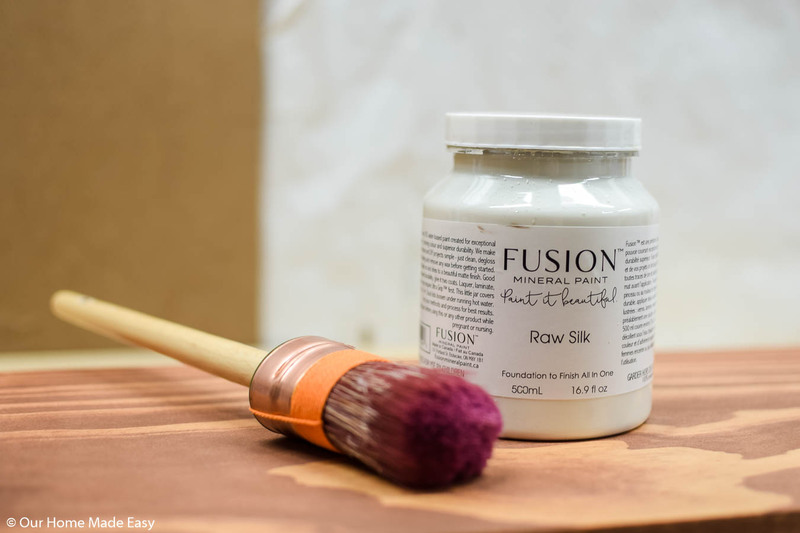 Related: Fusion Mineral Paint: Is it Worth Your Money and Time? Now it’s time to add your handles. Unless you’re adding some extra decor (keep reading below), this is your final step! Turn over your serving tray to the unpainted side. Line up where you would like your handles to go. Mark with a pencil and remove your handles. 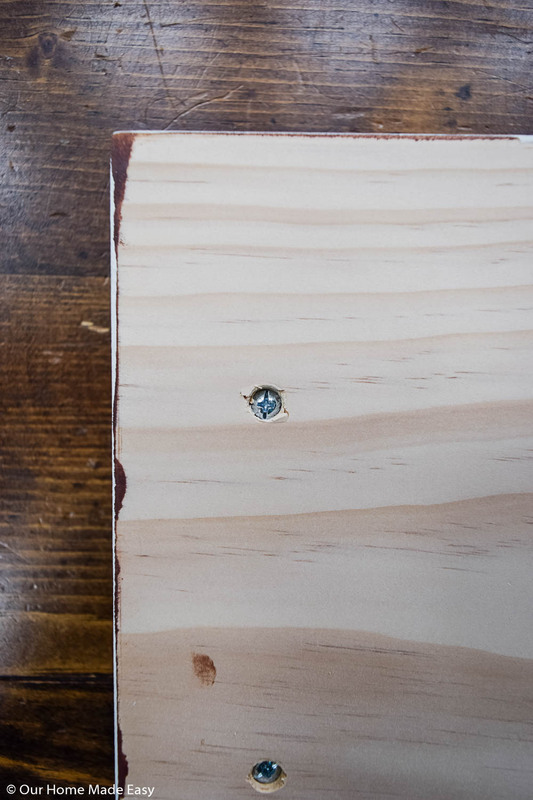 Using the hardware from the handles, drill the screws into your penciled marks. Attach the handle to the front side of the serving tray. Repeat for the second handle. This is completely optional. You could add a monogram using this no-cutter needed stencil method. Or you could find a farmhouse saying transfer and add it to your serving tray! For this serving tray, I ended up keeping it plain without any extra decoration. How cute did this quick craft turn out being? When your serving tray is ready to go, add some greenery, a pretty candle, and another knick-knack. I’m a total sucker for monograms (love for my time in Alabama) and wood beads. I am already thinking of different ways we can use them throughout the house. And that is it! 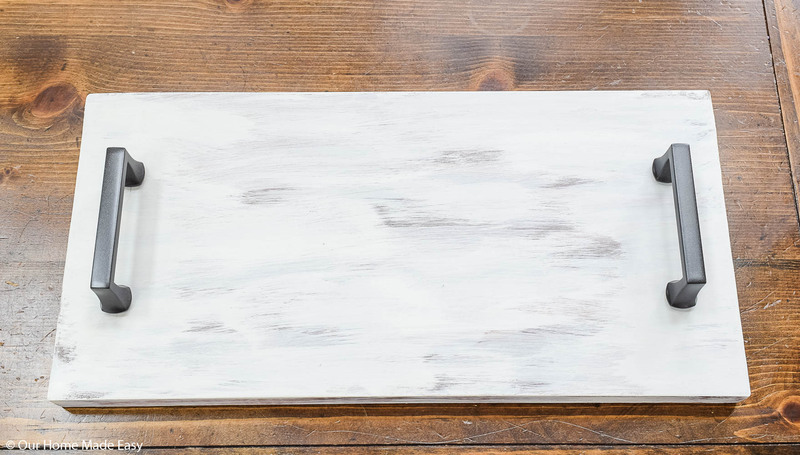 This serving tray is a really great way to build up those layers in your home to make it feel cohesive & complete– without breaking the bank. Do you love simple serving trays around the house? Or do you have another favorite way to add some coziness? 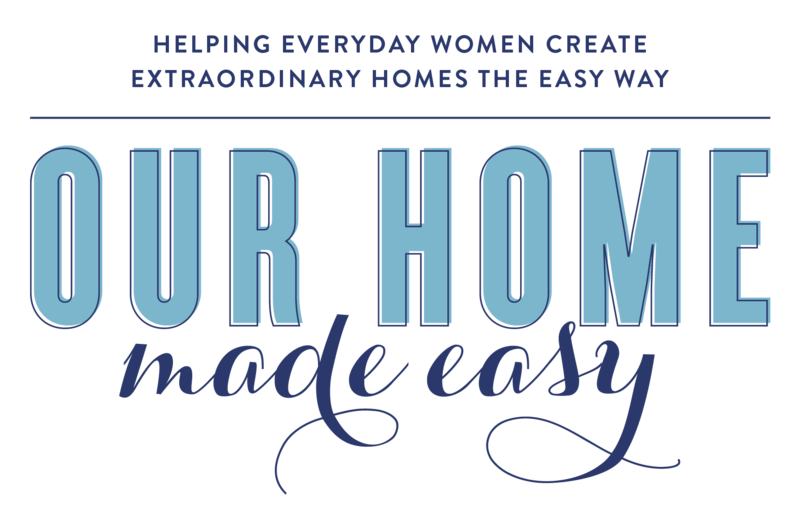 Love DIY crafts around the house? 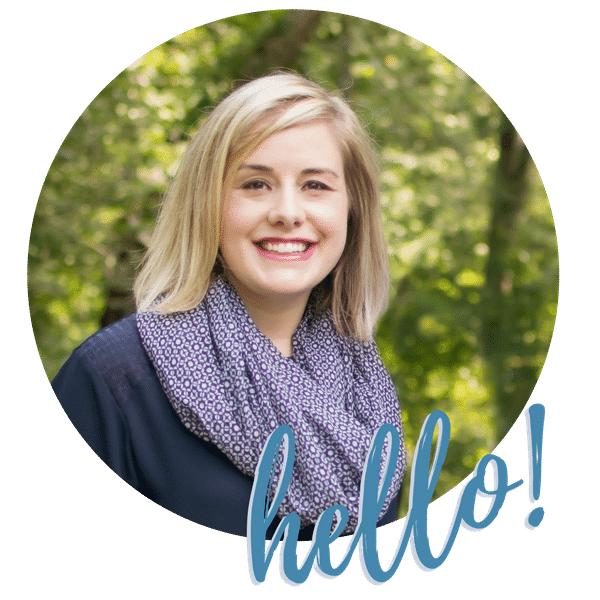 Get your free copy of the 5 tools to have for easy DIY-ing below!